Photographers and anyone involved in the professional photo licensing business have a love/hate relationship with social media. Great marketing tool to display their latest photographs but with no revenue. Worse, social media platforms generate millions on the content being shared. This might change. 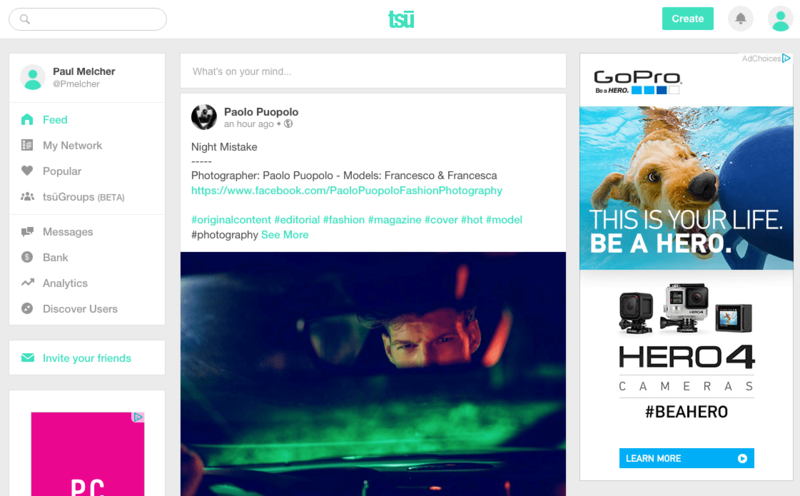 Tsu.co ( pronounce “soo”) is a recent newcomer in the crowded world of social media. The interface is a mix between Facebook and Instagram and offers nothing new. But it’s how it functions that matter here: unlike its older siblings, Tsu shares the revenue it makes with its users. The process is simple: the more your pictures gets views, the larger the pie you get. It also gives you a cut from the content generated by people you refer to its platform, making you a paid ambassador. Tsu’s interface is as familiar as it can be. More precisely, Tsu takes 10 percent of every dollar generated by the site via advertising. The remaining 90% is automatically distributed through a top-down lineage of users — 50 percent to the original creator of the revenue-generating post, and then diminishing percentages to the user who referred the poster to Tsu. The appeal for photographers ( and photo agencies) is clear. Instead of having a massive following on Instagram which brings them nothing (besides instant gratification and maybe some outside work), they can here gather revenue directly from their images. More sales, less marketing. No one gets paid before they accumulate at least a $100 payout and the site would prefer if you didn’t cash out at all. Instead, they would like you to use your credits to buy from other Tsu members. Already, some businesses are accepting Tsu payments in exchange for products ( like juice) and some charities will accept it as a donation. Maybe one day one could also buy a new lens, DSLR or laptop. For now, Tsu claims 3.5 million users in 6 months. Running on private investment ( Tsu raised a $7 million venture investment last year from Sancus Capital Prive), it is in the process of raising its series B. It might be a while before it is truly profitable ( some analysts say they would need 100 million users) but success stories are starting to emerge : Kevin Hinkle, cleared $10,000 on the site, and Kimberly Henderson, a South Carolina mother who paid a mortgage payment with her Tsu earnings. No signs of a successful photographer, yet. Copyright infringement can be reported directly from the site and are handled internally by the Tsu staff. Ultimately, they will certainly need to automate the process as this is clearly not scalable. Like any new social media platforms, adopting it early can be extremely beneficial since you are easily discovered. However, if the platform doesn’t succeed in scaling, it can turn out to be a huge waste of time. With enough traction, and even if it doesn’t succeed, Tsu might, at least, be able to force its competitors to start implementing a profit-sharing mechanism that is long overdue. If you want to try Tsu, you can use my reference here. finally … a move in the right direction for photographers! Osama Silwadi liked this on Facebook.